Happy New Year! I hope everyone had a wonderful holiday season, filled with friends, family, and lots of vegan treats! During my holiday break from blogging, a new vegetarian/vegan restaurant opened in Midtown. The owners of the very vegan-friendly Thai Basil restaurant have transformed the Level Up Lounge upstairs from Thai Basil into VEG, a restaurant serving all vegetarian and vegan dishes. I stopped by twice last week to see what was being cooked up at VEG. During my first visit, I tried the samosas, small turnovers filled with curried potatoes, peas, and carrots. The pastry was flaky and the filling was delicious. 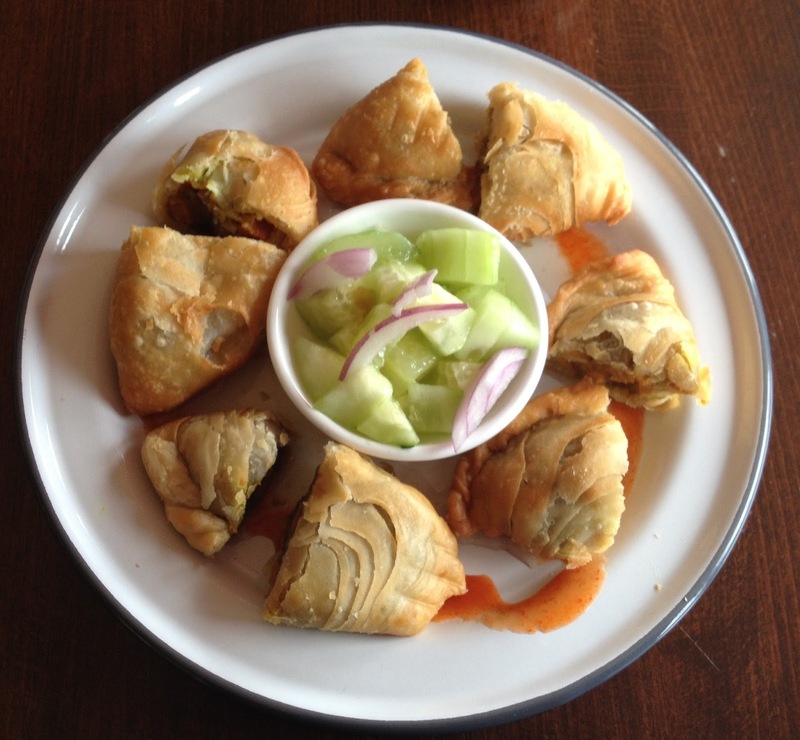 I expect to enjoy many more samosas during future visits! I also ordered the curry bowl, which is available in either individual or family size. 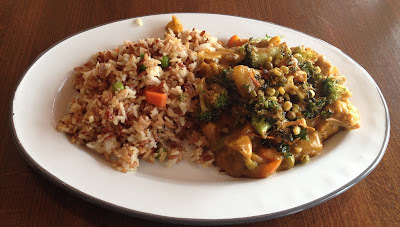 Believe it or not, this enormous plate of tasty curried vegetables and brown rice was the individual portion! The cuisine at VEG is described on their Facebook page as being "Ayurveda-inspired," and this dish, with its variety of flavors and colors, is a good example of the chef's culinary approach. 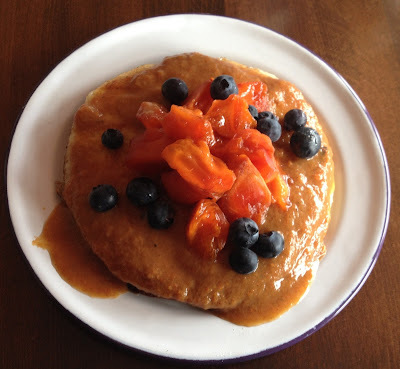 The next time I visited VEG, I decided to try a breakfast item, so I ordered the VEG cakes, made with lentil flour and served with a thick persimmon sauce. I had seasonal fruit added for an extra cost, so my cakes were topped with beautiful persimmon chunks and blueberries. This hearty dish, consisting of two cakes, is also gluten-free. VEG is currently in the soft opening stage, so the hours and menu may change. The menu is not available online yet, but the vegan items currently offered include fried tofu (definitely trying that on my next visit! ), soup, salad, and tofu scramble, in addition to the dishes described above. VEG is located at 2431 J Street, second floor, and their phone number is 916-448-8768. They don't have a website yet, but their Facebook page can be found at https://www.facebook.com/vegcafemidtown/?fref=ts&ref=br_tf. Currently, the restaurant is open Sunday, Tuesday, and Wednesday from 9:00 a.m. to 4:00 p.m., and Thursday, Friday, and Saturday from 9:00 a.m. to 10:00 p.m. The restaurant is closed on Monday. Maybe we should go there the next time we have lunch out, Anne! Thanks! I appreciate this info since they don't have a menu online! Glad you found the information helpful, Jessica! Since VEG is still in the soft opening stage, they're probably still trying to work out what their menu will consist of. If you decide to go, I'll be interested to hear what you think!